Beginning last school year, MPA made a commitment to becoming an even more Food Allergy Aware School and has been guided in part by the voluntary guidelines set forth by the U.S. Department of Health and Human Services and the Centers for Disease Control and Prevention. We defined guidelines for our school community, enhanced procedures, and provided additional training and resources for faculty and staff related to all food allergies. Due to the rising number of students at MPA with life-threatening peanut and/or tree nut allergies, and the rising rate of food allergies in general, MPA will prohibit foods with peanuts and/or tree nuts throughout the school and at all school events beginning July 1, 2019. According to the Centers for Disease Control and Prevention, food allergies are a growing food safety and public health concern that affect an estimated 4%–6% of children in the United States. 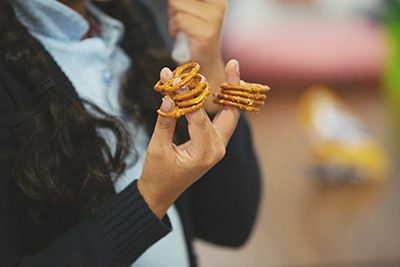 One in five children with a food allergy will have a reaction at school. It is important to note that in the United States, fatal or near fatal reactions are most often caused by peanuts and tree nuts. As the data shows, food allergies are very common and very serious—peanut and tree nut allergies are particularly dangerous. I am very confident that our inclusive and respectful community will navigate this transition beautifully. Please model a positive approach to this topic with your children, help them care deeply for one another, and do all they can do to promote the safety of our student body. Peanuts and tree nuts are strongly discouraged in Middle and Upper School. With this change on July 1, we are expanding the current Lower School guidelines to include Middle and Upper School with only one exception: If a food is “manufactured in a facility” or “processed on the same equipment” it will be allowed in Middle and Upper School. However, those food items will continue to be prohibited in Lower School as the current guidelines state. There will be no changes to the current guidelines in Lower School. The overarching principle of MPA’s guidelines—both now and in the future—is to minimize as many risks as possible while realizing that it is impossible to eliminate them all. There are no reasonable or fail-safe ways to prevent any specific allergen from entering our school, but we will all work together to reduce the chances. You may access MPA’s new Allergy Aware Guidelines and Protocol here. They will be posted on MPA’s website on July 1, 2019 when they go into effect. You may also access a one-page document that summarizes the new guidelines here. This will be laminated and distributed in Back to School folders for your handy reference. As we begin the 2019-20 school year, we will offer community education about food allergies to families, students, faculty, and staff. We will help you take the reasonable precautions that will be necessary to follow the guidelines and we will support the community during this important transition. To that end, we’ve established an email account for questions: foodallergies@moundsparkacademy.org. Our team consisting of the school nurse, Julie Koster, and school administrators will reply to your questions to help ensure a smooth transition and provide ongoing assistance. Please direct your questions to that email address and not to the families of children with food allergies. Taking the next step toward becoming an even more Allergy Aware School is a tangible manifestation of how MPA creates a welcoming, caring environment for all students that is closely attuned to the social, emotional, and physical health of all. Thank you so very much for your attention to this very important topic.